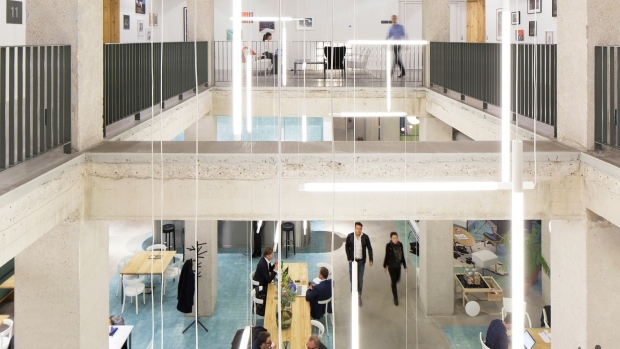 IWG Plc’s co-working unit Spaces is making its biggest expansion in North America with deals to rent large chunks of office space in Toronto and Vancouver. In its largest-ever lease, Spaces is taking 127,158 square feet (11,813 square meters) at The Well, Allied Properties Real Estate Investment Trust and RioCan Real Estate Investment Trust’s office project in the heart of Toronto’s technology district. In Vancouver, the Amsterdam-based company will rent 120,393 square feet at a building under development by Allied and Westbank Corp. Both locations would open in 2020. Spaces, which in a span of 10 years has opened 137 locations in 94 cities globally, is expanding to help feed an increasing appetite for flexible offices -- a segment of the real estate industry that’s dominated by fast-growing companies such as WeWork Cos. Brokerage Cushman & Wakefield estimates that “in the foreseeable future,” co-working space will represent as much as 10 percent of the office inventory in many markets. Switzerland-based IWG, which unsuccessfully tried to sell itself in recent months, also owns the serviced-office provider Regus, its longstanding brand aimed at more-conservative tenants. IWG has been investing heavily in the expansion of Spaces as it seeks to revitalize its portfolio and capture a younger, hipper market. Spaces locations have trendier design touches, like glass walls and warm color palettes, and offer such perks as coffee from local roasters. By the end of this year, Spaces aims to have 68 locations in North America and 197 worldwide. On Sept. 26, it’s opening Spaces Hudson Yards in Manhattan, part of a plan to double its New York City footprint. In Toronto and Vancouver, the growth of a workforce that includes startups, entrepreneurs, freelancers and consultants makes the cities ripe for Spaces’ expansion, Berger said. The new locations in Toronto and in Vancouver -- 400 West Georgia -- would be the company’s fifth and fourth, respectively, in those cities.